We sometimes talk about homes that have suffered from abuse from their owners. A friend of mine ran across this example in a home he bought recently. The furnace had been run for years without a filter. You can imagine how this impacted the unit’s efficiency for both heating and cooling. This is something that I think any buyer agent should understand and be able to talk about. This isn’t highly technical and it certainly isn’t a buyer’s agent’s job to open up a furnace, but, a buyer agent should understand this. Many real estate agents call themselves buyer’s agents but don’t know much about houses. This is unfortunate. Our people understand homes and we are willing to tell you what we see. Remember if you want an unconflicted, true buyer agent to help you with your home buying, call us. In the business of helping home buyers I am often working on Sunday afternoon. When I don’t have appointments though, I like to take a Sunday afternoon nap in front of the woodburning fireplace. Yesterday my life took me in a different direction. You see we live in a ~40 year old home that has a drain line that gets really slow about every five years. It is a drain line for the dishwasher and the laundry, so I’m thinking it is probably laundry lint and maybe ground food that collects in some low spot. Unfortunately the “low spot” is under our basement floor. So the solution is to auger it out every couple years. And yesterday it was time. Previously I was able to clear the run with a 25 foot drill mounted auger. But this time I sent that thing all the way out and the drain was still sloooow. So off to Lowe’s to get a 50 foot model. Most real estate agents that claim to be “buyer agents” don’t want to actually tell buyers anything about the houses themselves. Like, disadvantages and advantages of living on a city sewer system vs a well and septic system in the country. Like disadvantages and advantages of a hot water heat system vs a gas forced air. There were a bunch of discussions on thisl forum about this very topic. Judging from that thread it would seem that the majority of the regular real estate agents are afraid to say anything bad about a house! If you have excellent credit and will be buying a $100,000-$900,000 home in the next 90 days and would like a company and agent who will work exclusively for you, call us at 734 662 6240 or contact us via the link on this page. The Home Buyer’s Agent of Ann Arbor, Inc. Exclusive Buyer Brokerages like ours do not list homes and never represent Sellers. Their agents represent Buyers ONLY on the Buyer’s side of the transaction. I was visiting a friends home this weekend and he showed me what the dish service people did for his mounting. He lives in a area where roof mounting isn’t practical, and wall mounting won’t work because of the type of construction of his home. So the alternative was a ground mount. 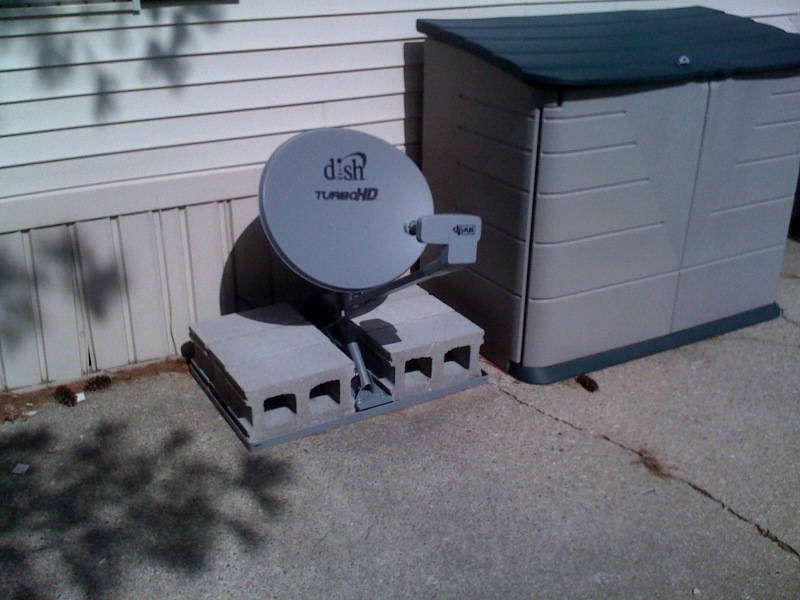 The dish contractor brought the steel frame and the cinder blocks to keep is secure. Select Solar And Generator, a Michigan solar panel installer, has signed a contract to design, install, and commission a solar roof for Jon Boyd, a local home buyer’s broker and nationally recognized home buying expert. The installation will have the ability to provide virtually all the electric power needed for Boyd’s 1966 country ranch home. 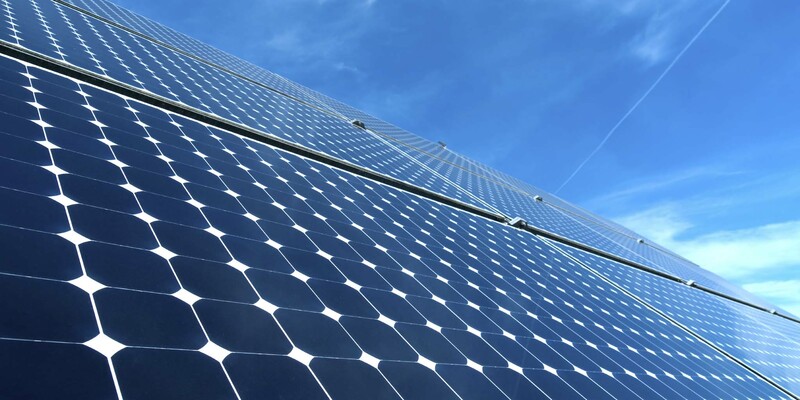 The Ann Arbor home is served by DTE Energy and a significant portion of the solar photovoltaic system installation costs will be covered by DTE’s SolarCurrents program. What is wrong with this picture? Why have an inspection? So often we talk with real estate agents who question the choice of inspectors or question the reasons for even having an inspection. As the company that represents buyers in our area I am not surprised. But sometimes I see an issue so obvious I think that anyone in the business should be able to identify it. Unless you are in your first year in this business you should really see one obvious and one more subtle defect with this installation. And, we rely on home inspectors to find and document these types of concerns and since both of them are safety related, they may be worth discussing with a home seller for a credit or repair by a licensed contractor. If you are a buyer considering who to use as a buyer’s agent or a designated buyer’s agent, you may want to make sure those you are considering have enough knowledge of homes to discuss topics like this with you. We serve the Ann Arbor – Brighton – Plymouth – Novi – Canton – Ypsilanti – Saline – Chelsea – Dexter – Novi – Northville areas in Southeastern Michigan. LED Bulbs. Not Always Reliable. In Fact, Some Aren’t Even Safe! A lot of people are promoting LED bulbs these days. I have been evaluating LED bulbs for a couple years now and I do think they have reached the point where they are worth considering for many applications in the home. 1. Many of my LED lights have had much shorter life than claimed. An individual LED may have a 50,000 hour design life, but in practice that LED is usually combined with 20 to 50 other LEDs and a circuit with a dozen other components. 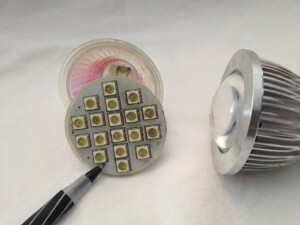 Even if one LED is reliable, when it is combined with a bunch of other components, the system, (the bulb in this case) is much less reliable than the individual parts. In addition if the design isn’t done well to start with the components may be used outside of their design parameters which will often dramatically lower their actual life time before failure. I think that is the case with some of the LED failures I’ve seen on “generic” LED bulbs purchased over the internet. Some of these bulbs have lasted less than two years in moderate use, some have even failed in the first few days. 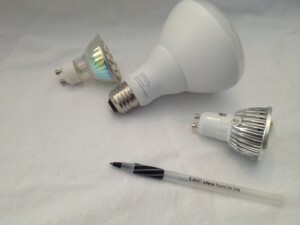 Two of the LED bulbs I purchased at Costco failed early also. I notice Costco stopped carrying that type shortly after my purchase so I’m thinking I wasn’t the only one with a negative experience. The term “safety” is a bit subjective, as anyone who deals with home inspections knows. In this case my reference for safety comes from electronics design work I did some 30 years ago relating to the safety standards of Underwriters Laboratories. Fundamentally, a design needs to keep potentially lethal voltages away from human contact. Voltages greater than 48V are considered lethal. To keep that safety separation you need a casing, or small vent holes, or some distance designed into the product, or an isolation transformer or some combination of these. The circuitry in a lot of these inexpensive LEDs does not have an isolation transformer or any of the other safety methods. 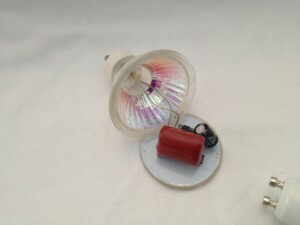 And if there is no cover on the LEDs there is voltage exposed on the front of the bulb. The bulb circuit is just a high voltage AC capacitor, two resistors, a bridge rectifier and the LEDs in a series-parallel string. If I touch one of the exposed LEDs on the front of the bulb when it is on I would feel a poke. I consider this quite unsafe. If you touch the bulb on the left where the pen is pointing while it is on you will likely get a shock. The bulb on the right looks reasonably safe because the lense keeps you from being able to touch any components. For additional information on LED bulbs in practice check the post at http://actvra.in/49Dq from home inspector Reuben Saltzman. In the last ten years our office has purchase a lot of homes with some form back-up power. In one case a home near Maple and Wagner had a priority circuit system that was replace with a whole house system. At an inspection yesterday we saw a dangerous non-interlocked system. We’ve seen all kinds, big, small, safe, unsafe, automatic switchover, manual switchover, gas powered, propane powered, and natural gas powered. But every one of them was set up for a single type of fuel. This has always been a concern of mine because none of the back-up fuels is perfect and in an emergency any particular type of fuel might be in short supply. Fortunately there is an option that allows most generators to be adapted to multiple fuels. A company called US Carboration produces kits that will allow a generator to use multiple types of fuel. They have produced products like this for a long time. If you have experience with one of these installations please share your thoughts in a comment below!